This indispensable text has been updated to include a variety of contemporary topics, case studies, legal trends, and expanded discussions. 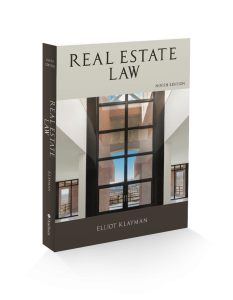 Limited liability companies, condominiums, the Fair Housing Act, predatory lending, subprime loans, green development, and other key concepts are discussed in a straightforward, easy-to-read style. Learning objectives, case studies, review and discussion questions, and suggested readings are just a few of the learning tools used to enhance student understanding.